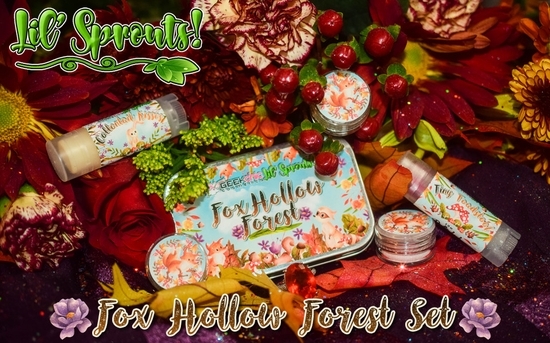 Join all your favorite critter friends down in Fox Hollow Forest, where the air is clean, the water is clear, the verdant trees protect adorable families of squirells, and everything everywhere is soft pastel watercolors. Squee indeed. Squee indeed. Chipper Little Chipmunk (3gr eyeshadow): Chipper Little Chipmunk is a soft ivory based shadow with a soft mauve undertone and a pink-silver-green color shifting duo chrome sheen. It’s the perfect color to use on the inner corner of the eye as well as a highlight on the browbone. Chipper Little Chipmunk is lip safe and makes a very soft, yet pretty lip when mixed with a little bit of clear lipgloss. Chipper Little Chipmunk is shown swatched over our Power Up Primer, and photographed with diffused, cool-toned flash lighting. Fanciful Fawn (3gr eyeshadow): Fanciful Fawn is a soft fawn brown based shadow with a subtle iris violet sheen. It’s a great color to use in a single wash look, or as the midtone color in a more complete look. Fanciful fawn is also lip safe and looks very pretty and natural when patted on over a chapstick and then the lips rubbed together to combine. It is shown swatched over our Power Up Primer, and photographed with diffused, cool-toned flash lighting. Teensy Tree Frog (3gr eyeshadow): Teensy Tree Frog is a soft froggy sage green based shadow with an ethereal gold-peach-copper color shifting sheen. It’s gorgeous when used to deepen the crease in a natural look. While pretty, Teensy Tree Frog is not for use on the lips. It is shown swatched over our Power Up Primer, and photographed with diffused, cool-toned flash lighting. Tiny Toadstool (Butterlush Bloom): Tiny Toadstool may look bold in the tube but it is a lovely whisper of maroon jelly tinted balm. While it is very soft in a single stroke it can be built up for a deeper looking flush of red. Tiny Toadstool is flavored in a scrumptious, sugary sweet Nana’s spice cake with butter creme frosting. Butterlush Blooms are super luscious tinted balms jam packed with skin loving butters and oils for a seriously pampered pout! There are SIX seriously luxurious butters including: Cocoa Butter, Shea Butter, Mango Butter, Pumpkin Seed Butter, Murumuru Butter, and Cupuacu Butter. With skin loving oils like green tea oil and avocado oil for a seriously butterluscious kiss!